In this frame from video provided by NBC4, smoke rises from vehicles as a fast-moving wildfire swept across a freeway near Hesperia, Calif., July 17, 2015. A few minutes before they had been on the vacation of a lifetime, but now Russell Allevato and his family were running for their lives from a raging brushfire that had trapped them and hundreds of other terrified people on a traffic-jammed highway connecting Los Angeles to Las Vegas. "People were screaming. It was just crazy," said Allevato, who watched helplessly Friday afternoon as flames engulfed his rental car and destroyed everything inside it while he, his nephew and two teenage daughters fled to safety. "We were surrounded by the flames. They were to the left, then in front of us and they came around to the right. We were in a big horseshoe in the middle," he said as he spoke by phone from the safety of a California Highway Patrol vehicle. The fire in the winding, mountainous Cajon Pass 55 miles northeast of Los Angeles began about 2:30 p.m. Friday in drought-ravaged dry grass below the elevated lanes of Interstate 15. Pushed by 40-mph winds, it raced up a hill and onto the traffic-clogged freeway, trapping literally hundreds of people amid a cauldron of smoke, flames and ash. "We had some highway patrolmen who said they had never seen fire travel that fast," said Greg Kieran, a San Bernardino County Fire Hazmat specialist. "It just overran these people before they even knew what hit them." Drivers and their passengers had no choice but to abandon their cars as the flames hopscotched down the freeway, destroying 20 vehicles, several of which exploded in fireballs. Four structures in the nearby rural community of Baldy Mesa also burned as the flames raced across 3,500 acres. The blaze was only 5 percent contained early Saturday. 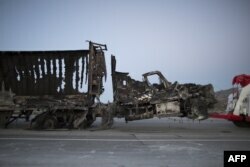 The scorched remains of a truck are towed at the North Fire, which caused people to abandon their vehicles and flee as flames jumped the 215 freeway near Victorville, California, July 17, 2015. Amazingly, only two people were injured. Both suffered minor smoke inhalation, authorities said, but declined medical attention. Among those trapped by the flames was Lance Andrade, a 29-year-old railroad conductor from nearby Apple Valley, who found himself caught in the traffic jam just as the fire jumped the freeway. Soon people were running toward him and he joined them, only to find there was nowhere to run. Flames had surrounded him and the others. A panicked looking firefighter ordered everyone to take cover, and Andrade said he huddled with four other men and two elderly women in the back of a tractor-trailer rig until the flames passed. One of the women, who had become separated from her family, began to cry. Everybody was terrified. "You could hear the explosions from people's vehicle tires popping from the heat," Andrade said. "You could hear crackling. Smoke was coming in every direction. You could feel the heat. We just waited it out and prayed to God." Television helicopters carried the scene live as flames leapt from vehicle to vehicle while water-dropping helicopters and then firefighters on the freeway battled to get control. Firefighters' initial effort was hampered by five drones that were being flown in the area when fire broke out, said Lee Beyer, a U.S. Forest Service spokesman. He said several firefighting aircraft were delayed or diverted until the drones moved out of the area. Meanwhile, a car-carrying tractor-trailer rig and its cargo of eight automobiles went up in flames. So did a boat being transported by another vehicle. Allevato and his family fled their rental car so quickly they left all the clothes and other belongings they had brought with them from Southgate, Michigan. The vehicle was reduced to a charred hunk of steel. Some drivers did manage to get off the highway, turning onto rural side roads that quickly became clogged with traffic. "When the fire just jumped to the other side of the freeway I thought, `It's really hot and my mom is in the car. And if we have to run. It has to be done now. Quick, before we get stuck here and roast," Venzor said. "People could not move their cars. People were running. I thought, `OK, this is it.' I really did," she said. Also in Southern California on Friday, a forest fire broke out in the San Gabriel Mountains, forcing several hundred campers to flee and threatening structures in the community of Wrightwood. David Cruz, a spokesman for the U.S. Forest Service, says the fire had spread to at least 25 acres of timber by late Friday. Los Angeles County Sheriff's Sgt. Diane Hecht said 90 members of a Girl Scouts troupe fled a campground in Wrightwood by bus. She said additionally, up to 300 campers were evacuated from another campground in the area. It being a Friday afternoon, however, Interstate 15 was typically jammed with vehicles traveling between Los Angeles and Las Vegas. 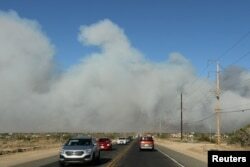 Adding to the congestion was construction work going on in the area, said San Bernardino County Fire Capt. Josh Wilkins. Allevato and his family had left Las Vegas earlier in the day for Los Angeles, where they had hoped they might me the Kardashian sisters at the family's West Hollywood clothing boutique. Allevato's 15-year-old daughter, Leah, was devastated.